This would not be the correct elbow as there are no elbows available for the kit you have ordered. The DVVK4RE is only meant for a straight horizontal termination through a wall with no offsets. 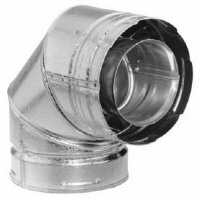 What centerline offset do I get when putting two of these Dura-Vent DirectVent Pro 45 degree elbows together? Putting two of these elbows together will give you 4 7/8" of centerline offset. To get the offset you need, you will want a 9" section between the two, giving an offset of 10 1/8" and a rise of 18 5/8". This is good quality. I received the item within a couple of weeks. Very satisfied.